Elephants are truly remarkable, unmistakable animals. Their huge size, giant ears, amazing trunk and incredible intelligence make them unique in the natural world. They are highly active, complex, wide-ranging animals who play a key role in the ecosystems they inhabit. Continuing in our tour of all things wild this month, we're pleased to bring you an excerpt from the new book 5 Elephants by Rob Laidlaw, an award-winning children's writer, Chartered Biologist and founder of Zoocheck Canada, a wildlife protection organization. 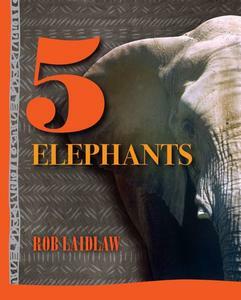 In 5 Elephants, Laidlaw shares the stories of five famous elephants, including Lucy, Canada's last northern elephant at Edmonton's Valley Zoo. Lucy's story is a sombre one, but Laidlaw hopes that raising awareness of it will protect other elephants from meeting similar fates. Lucy was born in the tropical wilderness of Sri Lanka. At 39 years old, she isn’t considered elderly yet, but she is closing in on her early 40s, a time when many elephants in zoos die. If Lucy were still part of a wild elephant family, she might already be a respected elder, helping to guide, teach and protect her younger family members. She would travel, forage, socialize and grow old with her family. But Lucy is far from Sri Lanka. She lives alone at the Valley Zoo in Edmonton, a small northern Canadian city with bitterly cold winters. The story of how Lucy came to Edmonton, Alberta, began in 1975, when the City of Edmonton decided to expand its Storyland Valley Zoo. With funding and plans in place, the Valley Zoo placed an order for a baby Asian elephant from a West German animal dealer. The zoo paid $8,939 for Lucy. When she finally arrived, she was greeted by prominent Edmonton residents and media. For the next 10 years, she lived alone at the zoo. In 1986 and 1987, Lucy was sent to the Calgary Zoo, a three-hour drive to the south, for breeding loans. She was bred many times, but she never produced a baby. The breeding loans stopped and Lucy was alone again, at least for a while. A couple of years later, Samantha, a baby African elephant that had been captured in Zimbabwe, was transferred to the Valley Zoo. Lucy was no longer alone. She finally had company. 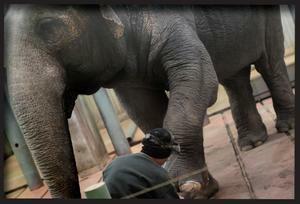 Like many zoo elephants, Lucy started to experience health problems. She had foot troubles, discharge from her trunk, arthritis, and bed sores on her face and hip. At times, she was also overweight, which would worsen the other problems as well. Lucy and Samantha’s conditions were not optimal, so the City of Edmonton allocated $2 million to upgrade the facility. However, the new exhibit still didn’t provide Lucy and Samantha with room to roam, hills to climb, pasture to graze, trees to pull down or places to swim. What’s more, they were still stuck inside during the cold Edmonton winters, where the temperature can drop far below zero. Lucy and Samantha lived together for years, but in 2007, Samantha was sent to the US on a breeding loan. She has yet to return. Lucy has been alone since Samantha left. For many years, Edmonton residents, animal-welfare groups and people across Canada have been expressing concern about Lucy being alone in a cold climate. 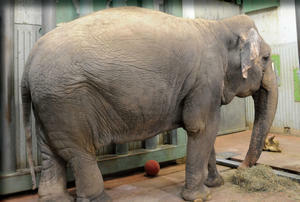 Thousands of letters have been sent to the City of Edmonton and the Valley Zoo asking them to send Lucy somewhere else. There have even been court cases. But the city and the zoo haven’t changed their position yet. Some people say Lucy is an antisocial elephant, but leading elephant scientists say there is no such thing. Every female elephant should be in a family or in the company of other elephants. Lucy was denied the opportunity to live a rich, natural life. She is unaware that she has attracted so much attention and generated so much discussion. 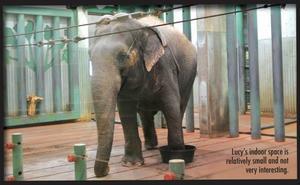 Let’s hope it leads to a better life for Lucy and all other elephants in captivity. Copyright 2014 by Rob Laidlaw, Fitzhenry and Whiteside. Used with Permission of the Publisher.